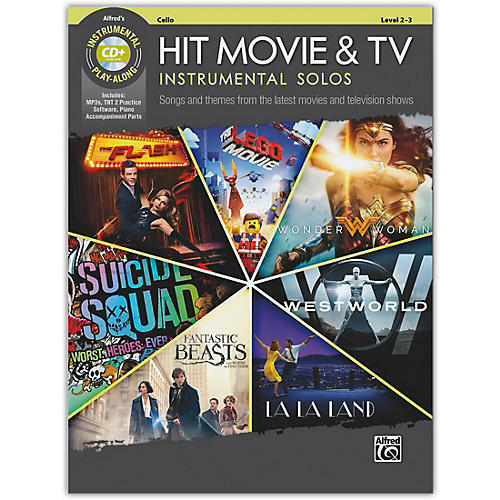 This series offers a versatile selection of hit movie and TV music for flute, clarinet, alto sax, tenor sax, trumpet, horn in F, trombone, violin, viola, and cello. Each book contains carefully edited arrangements appropriate to each instrument, and well suited for level 2--3 students. The CD includes a fully orchestrated demo track of each song, which features a live instrumental solo performance, followed by a play-along track. Also included are PDFs of piano accompaniments, and Alfred's Tempo Changer Software. Titles: Amazons of Themyscira (Wonder Woman) * Another Day of Sun (La La Land) * Beauty and the Beast (Beauty and the Beast) * City of Stars (La La Land) * Everything Is Awesome (The Lego Movie) * Ghostbusters (Ghostbusters) * Heathens (Suicide Squad) * Just Like Fire (Alice Through the Looking Glass) * Kowalski Rag (Fantastic Beasts and Where to Find Them) * A Man and His Beasts (Fantastic Beasts and Where to Find Them) * Mia & Sebastian's Theme (La La Land) * Newt Says Goodbye to Tina / Jacob's Bakery (Fantastic Beasts and Where to Find Them) * Runnin' Home to You (The Flash) * Westworld: Opening Theme (Westworld).